Palace Ruin functions as a stage for thematic concerts and an architectural lecture series. Palace Ruin is a fragment of Amsterdam’s own ‘Crystal Palace’, the Paleis voor Volksvlijt, which is being rebuilt in part by artist James Beckett. By echoing the ambitious cultural programme of exhibits and concerts staged at the original venue, the artist has arranged a series of public discussions about architecture and decay in association with TAAK, as well as a series of music performances in collaboration with Seamus Cater and Natalia Domínguez Rangel. 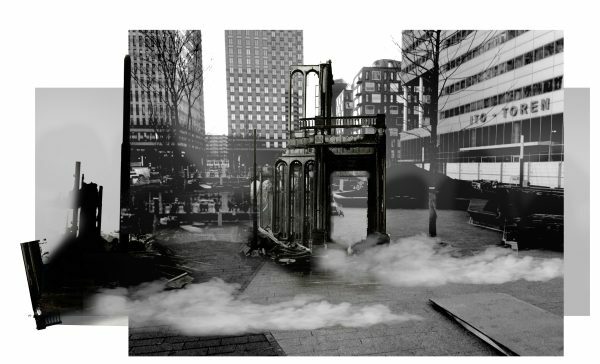 Palace Ruin can be found at the Gustav Mahlerplein, immeadiately outside of the Amsterdam Zuid station, from August 14 to October 14, 2016. This is followed by a concert of The International Nothing, a psycho-acoustic duo (Kai Fagaschinski and Michael Thieke) from Berlin. In a pipe-organ style they merge their two clarinets into one complex sound. Ironically, this often sounds like more than two voices, as multi-phonics and difference tones emerge. 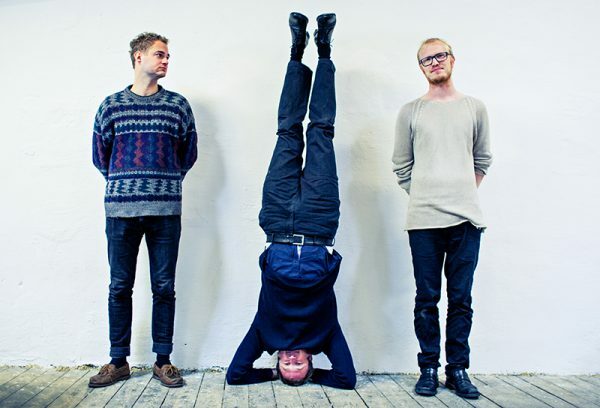 Their empirical composition style touches on delicacy, pleasure, humour and the utmost aural precision. The Paleis voor Volksvlijt was one of Amsterdam’s first glass-and-iron structures, which has inspired several lectures spotlighting material use. 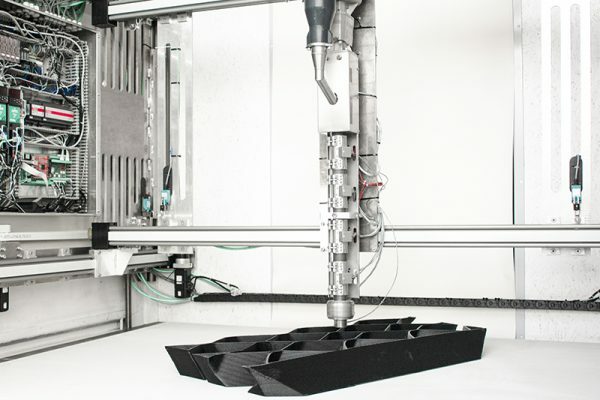 Architecture historian Tahl Kaminer investigates how the discipline of architecture has adapted to keep pace with societal advances, while DUS Architects explains how plastic and 3D-printing are opening up novel ways of working. This afternoon’s lectures examine the characteristics of neoliberal architecture and its impact on its surroundings. 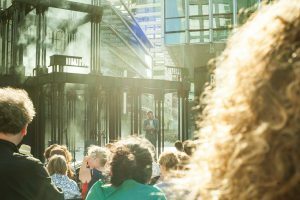 Artist Scott Raby will give a performative lecture in which he seeks to uncover the reality behind Zuidas, followed by a concert by N.M.O., who characterize their percussion music as ‘Military Danceable Space Music and/or Fluxus Techno’. Linda Vlassenrood of INTI (International New Town Institute) will lead a discussion about social aspects of the built environment. What are the values of ‘new towns’ like Zuidas and Almere and what response do they elicit from users? Michiel van Iersel of the Failed Architecture research platform will be talking with architect Douglas Murphy about his book on the relationship between modern architecture and ideas about failure. This will be followed by music and sound presentations that further resonate with the theme of design and decay. 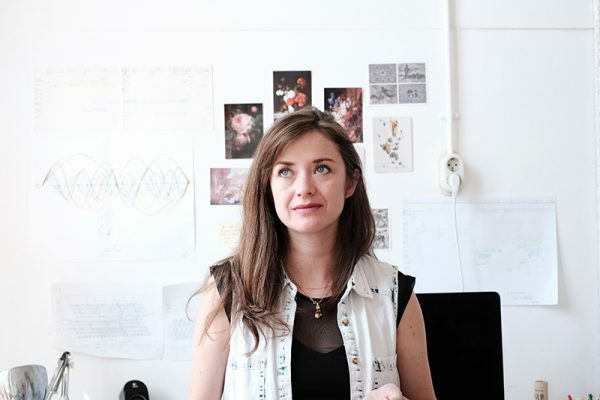 Composer Natalia Domínguez Rangel will present a sound installation inspired by Beckett’s Palace Ruin and War Tone will stage a conflict between club and ambient music and noise. Berlin-based record label YYAA will offer an earthy note as Rupert Smyth and Backtearer deal with high-technology in a way that is nonetheless organic. 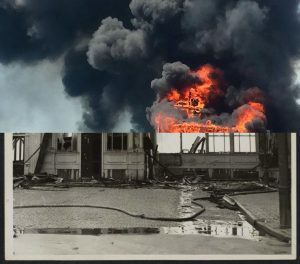 Curator and writer Jes Fernie has a long-standing interest in the subject of destruction, considering it as something that is potentially fruitful, poignant, engaging and politically transformative. Architect, artist and writer Tony Chakar muses on a Hogiditria icon found in the Kaftoun monastery in north Lebanon, as a means of deconstructing histories of representation, seeing and ‘writing’. Microtub, the world’s first microtonal tuba ensemble, will link the ruin to the history of atonal music, which developed in parallel to Europe’s glass palaces. The Palace Ruin program will conclude with a panel discussion led by Arjen Oosterman (Volume magazine) about the future of Zuidas. Referring to possible outcomes of this district, this debate is to be constructed by a panel of contrasts - exploring scenarios that are advocated by differing parties. The speculative side of thinking in ‘future’ or ‘futures’ as something planned or feasible will be discussed. Futures are also financial contracts in which one speculates on depreciation or appreciation of (packages of) stocks or bonds. This final meeting will thus be about the manipulability of this open urban district as part of the city and the Amsterdam region. Speakers are: James Beckett, Irene Ponec, Gideon Boie, Judith Lekkerkerker, Sebastiaan Capel. 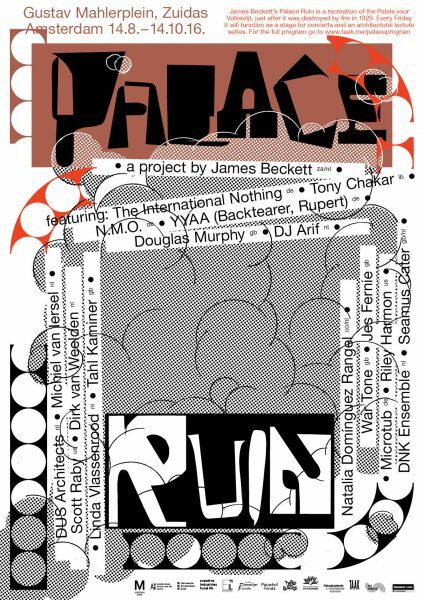 To follow, artist Riley Harmon will present a new performance collaboration with the DNK Ensemble, reintroducing the element of fire to the Palace alongside his own cunning play of temporal trickery.